I love lobster. One of the most memorable meals I had many years ago was a lobster pot pie in St. Martin. 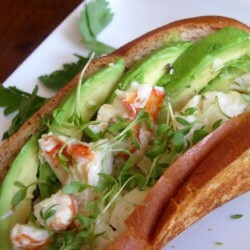 I also adore lobster rolls, whether classic or modern. And let’s not overlook the elegant steamed lobster, served simply with drawn butter. And then there’s lobster bisque. 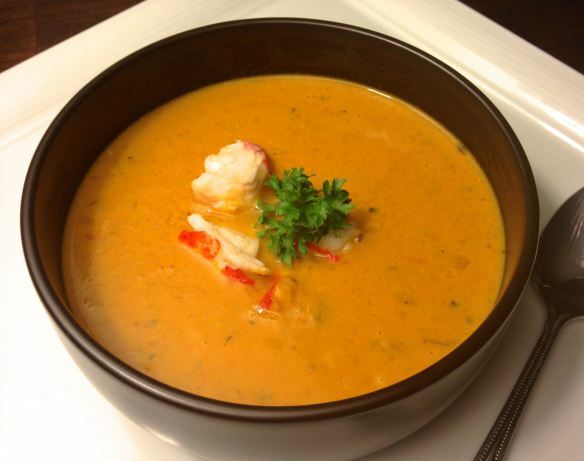 Creamy and rich, velvety and decadent, lobster bisque is a luxurious treat that I’ve ordered countless times over the years while dining out. Atlantic Fish, a restaurant here in Boston, has a wonderful version. One of Boston’s popular food trucks, Lobsta Love, also has a tasty bisque I recently sampled. 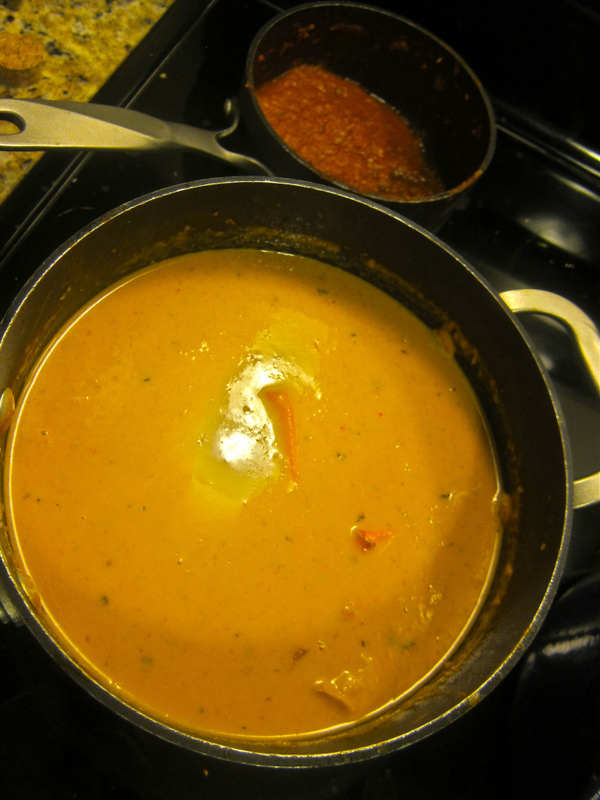 Despite my affection for the soup, I had never made lobster bisque until now. First, in light of my largely plant-based diet I just left it for restaurant fare. Second, I’m not down with the whole killing of the lobster thing, and I wasn’t sure if that was an essential step as my impression is that outstanding lobster bisque must begin with—you guessed it— homemade stock. Enter the Cambridge winter farmers’ market, which sells steamed, whole, local lobsters, providing me with shells that can be used in a stock and flesh that can be used in the soup. Ergo project lobster bisque, sans meeting the meat. Before you begin, do note that while this recipe is not terribly difficult, it is a labor of love that takes time and patience. It’s a great cooking project that does not require constant oversight, but you’ll need about 4 hours. Sounds ridiculous, I know, but most of that time the stock or soup is simply simmering at various stages. 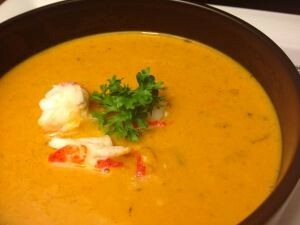 Pour yourself a glass of wine (or whatever), relax, and enjoy the process of creating homemade lobster bisque. This recipe equals or surpasses that found in many fine restaurants. UNBELIEVABLE. 1. Prepare the lobsters for the stock. Break up the lobsters by removing the claws, legs, swimmerets, and tail. Cut the bodies in a few pieces. (Don’t look into their beady eyes!) Remove the meat from the tails and claws and set aside to clean and use later. 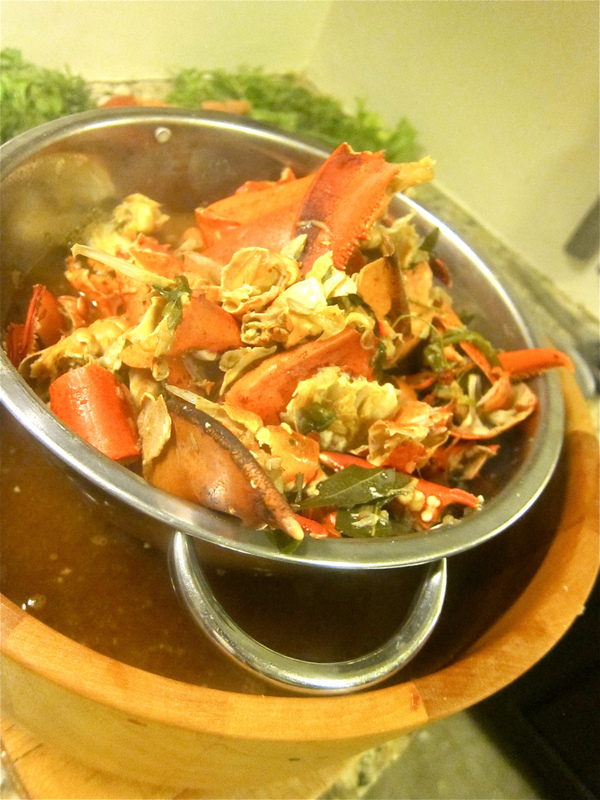 Make sure to conduct this procedure over a bowl to catch any lobster liquid, as you’ll want that for the stock. 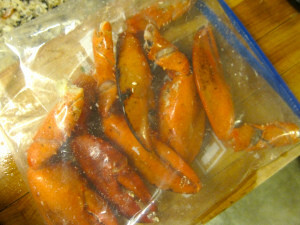 You might consider putting all the claws in a plastic bag as shown and smashing them with a mallet—or in my case, a hammer, when I could find neither my mallet nor lobster crackers. This will allow you to easily retain the juice while breaking apart some of the shells for the stock. 4. Make the soup. 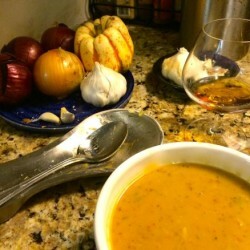 You have the flavorful base for the soup, and here’s where you have a few choices on how to proceed. First, the recipes I consulted advise straining this mixture once again to avoid having any solids in the soup (I suppose). You are welcome to do this, but I decided to omit this step. As the veggie mixture was quite finely chopped and had been cooking for awhile, the soup was basically smooth but for a bit of texture, which I personally like. It also then fully retains the nutrition and flavor from the vegetables, not incidentally. Up to you. Dissolve the the cornstarch in the sherry and whisk until smooth. Add slowly to the soup, along with the cream, saffron, and a few grinds of pepper, then bring up to a boil and down to a simmer for an additional 25 minutes or so. Taste. Are you happy with the flavor and viscosity? You could stop here if you like or proceed to the final step below. 5. Complete the soup. I actually found the soup quite tasty at the end of the previous step. However, I took this opportunity to fine tune the flavors and make it my own. I chopped 3 fresh tomatoes and sautéed them in a bit of olive oil with the remaining 2 cloves of garlic and a few more sprigs of fresh thyme (pull off the leaves gently). 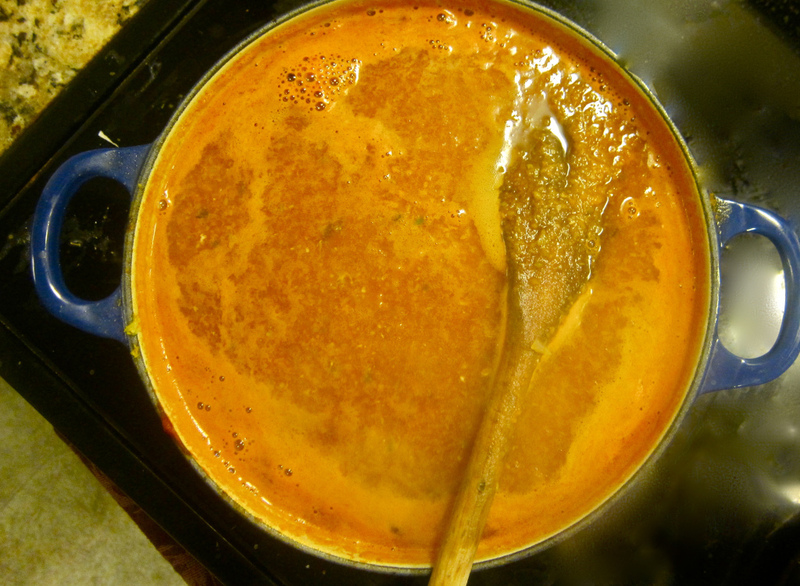 After simmering for 10 minutes, I added the remaining 1/4 cup of tomato paste and cooked down the mixture for an additional 7 minutes. I then puréed this mixture using a hand blender and added it to the soup. I also added the lobster legs back to the bisque at this point for additional flavor and let it simmer (yes, again) for another 20 minutes. Taste and adjust, adding a bit more cream and/or sherry as desired. Go easy on both; you can’t go back. Squeeze lemon or lime juice into the soup—you don’t taste it, don’t worry, it’s just to add balance and complexity—and give it a stir. Taste again and season with additional salt and pepper as needed. 6. Serve and garnish. Whatever happened to the lobster, you ask? Well, at some point during all that simmering you will have cleaned the lobster and cut it into pieces (whatever size you like). 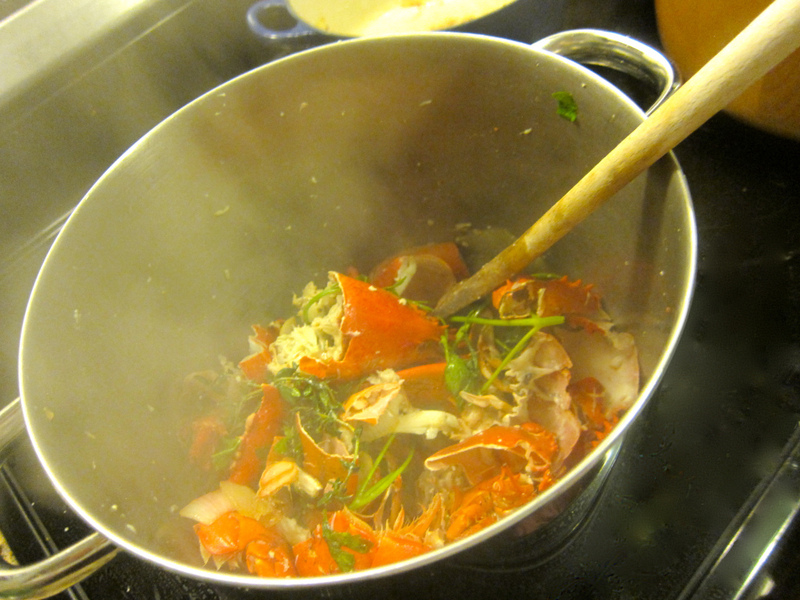 When you are ready to serve the soup, place 1/4 c or so of chopped lobster at the bottom of a bowl, then ladle in the bisque. Remember: the lobster is cooked already so you’re just trying to heat it through, and adding piping hot soup will do the trick. 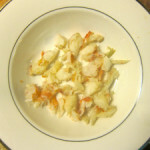 Do not add the chopped lobster directly to the soup, as it will become overcooked and tough. (I’ve learned this the hard way.) 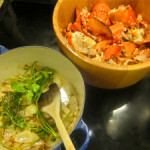 Garnish the soup as desired, either with a few lobster chunks and a parsley sprig or, for a little something different, perhaps a few sautéed shiitake mushrooms. 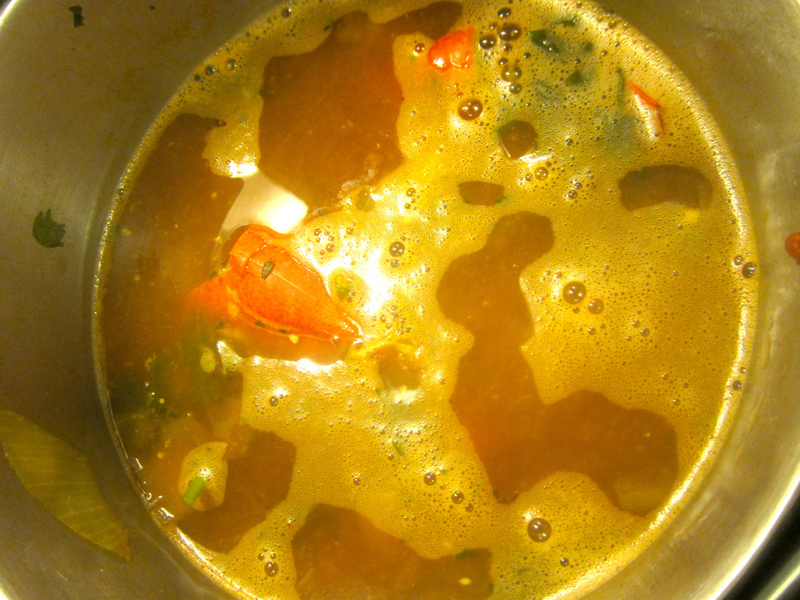 In my world, nothing beats homemade soup, especially when it begins with freshly made stock like this one. This is one of the most time-consuming dishes I’ve made, for sure, but the stock went a long way. Not only did I get about 10 cups of bisque out of this recipe, enough for more than 2 dinners for 2 people as a main course, I also saved 8 cups of stock for lobster risotto and put more than a quart of soup in freezer for another time. A labor of love indeed, but this sumptuous soup is perfect for special occasions like Valentine’s Day. Beautiful photos! This sounds heavenly. And I’m with you–not equal to the task of boiling alive a lobster. Cue either Annie Hall or Julie & Julia for requisite comic lobster-killing scene. Btw, thanks for the tips earlier in the blog on making veggie stock! I tried it out for the first time last month, and I’ve been enjoying the bounty until very recently when it ran out. I’m keeping a bag of veggie scraps in my fridge, looking forward to the next time. So nice to have a lower sodium, flavorful, and inexpensive alternative to store bought veggie broth! Thanks, Cat :). That’s steam clouding up one of pics, btw. And, yes, I was thinking of both movies during the writing of this post but I’m too verbose already & figured people would get it and/or insert their own story. I don’t see myself ever submerging a live being into hot water. Awesome news about making veggie stock – thank you for letting me know. (My life has value!). I actually just started a new bag of scraps myself yesterday when I had leftover carrot and celery fronds from the bisque. 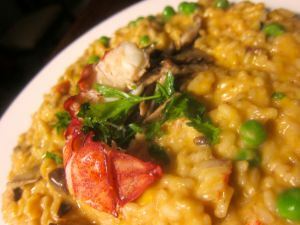 In all seriousness, though, if you are a lobster eater, you MUST MUST MUST make this at some point. I’ll only make it once a year or so, I imagine, but I am so glad to have it under my belt.